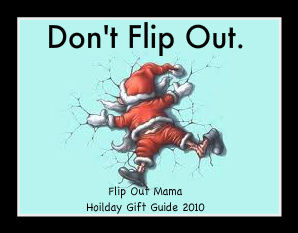 Ladies, I have the perfect gift for the guys on your list! Or, the girl who is scared of everything. Like me!! I would love to receive one of these as a gift! Mr. Beams makes intelligent L.E.D. battery operated lights. Their lights have motion sensors that activate the L.E.D. lights. Weatherproof and easy to install, Mr. Beams has a solution for any lighting need! 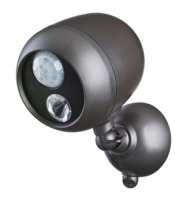 We received this lovely Outdoor Security Spotlight to review. This is perfect for us! As many of you know, we live way out in the middle of nowhere. There aren't any houses anywhere around us, and it is super dark outside. We really needed something to go outside by the shed, so if someone happens to come up the driveway, we can see them. Add to this the fact that every time someone or something comes onto our road, I am pressed to the glass to see what's going on (BD says I have Nosy Old Lady Syndrome lol), so yep, I am pumped about a security light for Christmas. This spotlight is one of the nicest security lights I have ever seen! 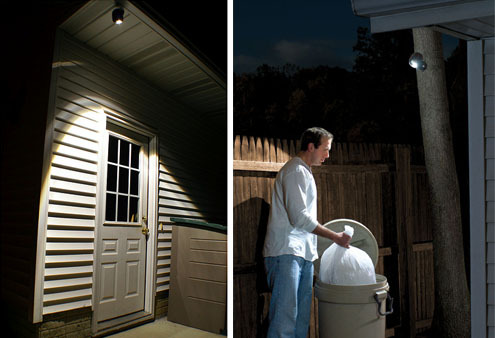 It has a motion sensor that automatically tuns the light on and off. 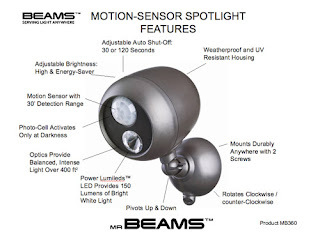 It has 180 degrees of motion detection, and can even detect motion up to 30 feet away. It has an auto shutoff that prevents battery drain, and with normal use, batteries last about a year! This spotlight is super easy to install! It only takes a few mintues, and I even think I could do it myself! (Not that I did.. LOL).. It requires 3D batteries, and all you do is install the two screws, and attach the spotlight! And you're done! I really like this motion detector light, and I am so glad that now I can be nosy, and see who I am looking at! Mr Beams can help you with any lighting needs you have!Whether you are looking for something to help with residential lighting, property management, industrial uses, or recreational lighting, they have got you covered! To check out Mr. Beams awesome lighting products, just click here!